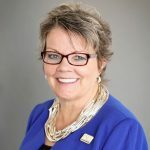 Dr. Linda Lujan is the President of Lamar Community College (LCC) serving Baca, Prowers, Kiowa, and Cheyenne Counties in rural Southeast Colorado. Lamar is the smallest of the thirteen colleges in Colorado Community College System (CCCS), the state’s largest system of higher education, serving approximately 144,000 students across Colorado. She began this role in August 2016. Prior to joining LCC, Lujan spent eleven years in administrative roles in the Maricopa Community College District in Arizona, where she served as the district’s chief new ventures officer, president and CEO of Chandler-Gilbert Community College, and academic vice president of South Mountain Community College. Before that, Lujan served eight years in administrative roles in CCCS, including academic dean at the Community College of Denver and director of educational technology at Arapahoe Community College. She also served as a full-time faculty member in Computer Information Systems at Arapahoe Community College. Lujan earned a Ph.D. in Community College Leadership from Colorado State University, an M.A. in Educational Technology Leadership from The George Washington University, a B.A. in Human Resource Management from Colorado Christian University, and an A.A.S. in Management Information Systems from Arapahoe Community College. She also completed a certificate in Executive Education for Sustainability Leadership from Harvard T.H. Chan School of Public Health. Lujan has published and presented nationally, serves on many local and national boards and committees, and has received numerous awards and accolades for her work, however, she considers her most important role to be wife, mother, grandmother, human being, and leader who believes we can all make a difference on this planet.